The Catoosa County Sheriff’s Office and the Catoosa County school system have worked together to provide a School Resource Officer (S.R.O) in each middle school and high school in Catoosa County and at the Performance Learning Center. 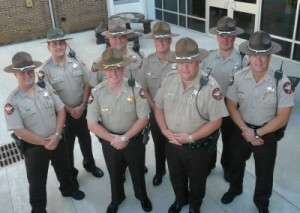 The Sheriff’s Office has a total of seven full time School Resource Officers. Corporal Kenneth Hooton is the supervisor for the School Resource Officers. Corporal Hooton can be reached at the Catoosa County Sheriff’s Office direct line, Ringgold Middle School or by e-mail. Before assuming the duties as an S.R.O, each Deputy must complete the 40-hour Basic School Resource Officer Course. The overall objective of the SRO program is to provide a safe and secure learning environment for each student in Catoosa County school system. All SRO’s are currently CHAMPS certified. Issue warning or citations to traffic violators on school property or wherever necessary. Investigate traffic crashes that occur on school property. Remove trespassers from school property upon the request of the principal or other authorized school administrator, or as the SRO deems necessary for the safety of the school community. Our School Resource Officer’s are there for you and your children. If a resource officer needs to be contacted they can be reached through their assigned school or by e-mail.